1. 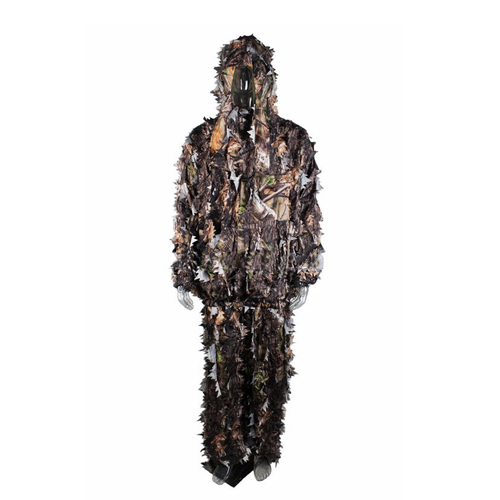 BREATHABLE & COMFORTABLE - The ghillie suit is made from polyester,it's quite breathable and comfortable.Feels very soft,and wears super light(only 0.95 lb).This feels smooth to the skin so you can wear a T-shirt underneath. 3.NONE ZIPPER DESIGN - Button desigh jacket(not zipper,and the leaves won't get caught in the zipper) make it very easy to get on and off.Nylon rope in hat will provide better hide. 4.ELASTIC WAIST - Elastic waist on trousers for easy size adjustment(27.5''-45.3'' waist),suit for almost all people.